The Playstation Network is offering all Uncharted 2 DLC free for Playstation Plus users. Naughty Dog has not excluded any piece of DLC in this mega deal. All Multiplayer Maps, Siege Expansion Pack, Character Skins, Golden Weapon Mods, Avatars, Dynamic Theme and the four part Motion Comic “Eye of Indra” are included. This is obviously to promote Uncharted 3 that is releasing on November 1st. Even if you aren’t going to play the multiplayer again the avatars, theme and the motion comic that I haven’t even heard of before are a nice bonus. This is an unbeleivable value and I am always fond of free stuff. Get it while you still can. I attempted to write this review only about on the God of War Origins Collection but I found myself immediately referencing Sony’s other HD collections. I realized then that doing a review of the collection would be the no different from reviewing Chains of Olympus and Ghost of Sparta as PSP titles. It makes more sense to look at these HD releases as a whole than doing comprehensive review of last generation games. I have been sucked into buying most of the HD releases while still owning most of the originals still. I will give a brief review of the ones that I own. First things first the HD releases convert the games to widescreen, clean up and replace textures and sharpen polygons. What doesn’t happen is the addition of polygons. Characters and objects that looked misshapen in the originals will still look misshapen. The HUD are usually redone to be sharper. The games run smoothly at 60 fps and are have more vivid colors. These are consistent most HD releases give or take one or two things. For people with 3D TV’s the HD collections have 3D support. Originally released in North America in a download only format we received the disc version after Europe. I only have the downloadable version so I do not know if the disc versions have new features. Then again it is Ubisoft and I don’t expect that much from them. Certain cut scenes look odd and I suspect that the original games were zoomed in to achieve widescreen. A few cut scenes have characters are slightly out of frame. I do not know if it’s a new issue or preexisting one but it’s not a big enough deal to confirm. The most surprising flaw in the collection are the glitches. The game engine caused animation glitches when performing certain actions and visual glitches when rewinding time. Those are minor but PoP: Warrior Within has numerous game ending glitches requiring a new game to fix. There were glitches involving cut scenes not triggering and portals that don’t work. It is unknown what causes these glitches. I played through WW several times and only encounter one game ending glitch that involved back tracking near the end of the game. I have not been able to confirm whether or not Ubisoft have fixed any of the game ending glitches but in my experience you won’t encounter them. Despite the glitches The Prince of Persia Trilogy is a great collection that excels in puzzle platforming. These games feel more complete than The newer PoP games despite their age. The Sly Cooper games are all cell shaded and cartoonish so in HD they don’t suffer as much as realistic character models. The Sly Collection adds brand new minigames. These minigames are compatible with the Playstation Move and supports up to four players. There are 4 minigames and designed with the Move in mind. They are mildly entertaining but you wouldn’t buy the collection for the minigames. The Sly Collection had content removed. Developer in-game commentary in Sly 1, hidden movies in Sly 2 and the original 3D levels in Sly 3 are now missing. I don’t know why Sucker Punch decided to remove some content from part 1 and 2 (Part 3 had cheap 3D levels with the old fashion 3D glasses and now supports new 3D technology) but are minor and strangely not all bonus content was removed. The Sly Collection is bright vivid and original. There is a lot of fun to be had in these games. Upon completing all three games there is an announcement trailer for Sly 4. There isn’t much to say about this collection other than character models look much better than the ones in Prince of Persia. Also to note that when first release it had a download code for the E3 God of War III demo which is absolutely pointless now that the game is released. The Origins Collection is the PSP ports thus are already in widescreen and doesn’t suffer from that conversion process from full screen to widescreen. The only new feature is an interview that can also be downloaded on the Playstation Network. There’s a good chance that a lot of people miss out on these games due to the fact that they are on the PSP. If you enjoyed the God of War games then you will feel more or less at home here. Both of the God of War collections hold up well and have a good amount of preexisting content for action games. Beyond Good & Evil is a hard to find game and has become a cult classic. You play as Jade and you have to uncover the secrets of an alien conspiracy threatening the galaxy. Jade is a female protagonist who is feels that she is as strong and attractive as she would have to be in this adventure. This is a unique adventure game that has a greater focus on stealth, exploration and puzzles rather than action. Beyond Good & Evil HD is the type of game that you don’t see any more. It is the type of game that draws inspiration from many games from the past but still being its own game. The game doesn’t use the fact that she is female as a sign of weakness nor does the game flaunt her femininity. Jade is Jade and Beyond Good & Evil shows that sometimes that can be enough. Resident Evil 4 HD unlike the others benefited the least for an HD title. Character models are improved but textures remain unchanged. The game appears zoomed but it is actually removing the black bars that were constant in previous version. The only new features are Trophies/Achievements and leader boards for Mercenaries Mode. The button layout has changed from the PS2 version. The run and action buttons are reversed to match the controls seen in RE5 and I believe that the Ashley command button has also moved. Personally I don’t understand why they did this and why there isn’t an option to revert them. Most games that use tank controls and Mario games have the run button to the left of the action button for easier control. I love Resident Evil 4 and I own it for Gamecube and Wii but the changes in the control layout are off-putting. If you have played Resident Evil 5 and have yet to play 4 then you will see just how much 5 has borrowed from 4. These HD releases are mainly graphical updates and lack many or any special features. That isn’t such a big deal to me. I don’t expect for developers to start adding more game to their games that not forward thinking. The visuals are bright and vivid and add a lot to already great games. For those who have never played these games before I give them recommendations. Certain elements of some games may feel old but these were wisely chosen games. If you own the originals and are on the fence about them ask yourself if you want to play them again but don’t want to pull out your old system. On September 3rd of 2011, Ubisoft released Assassin’s Creed Revelations multiplayer beta to Playstation-Plus members and Uplay members; only exclusive to PS3 owners. As an avid fan of Assassin’s Creed Brotherhood’s multiplayer, it is only fair that I soaked my mind into Ubisoft’s second installment of an Assassin Creed’s multiplayer. 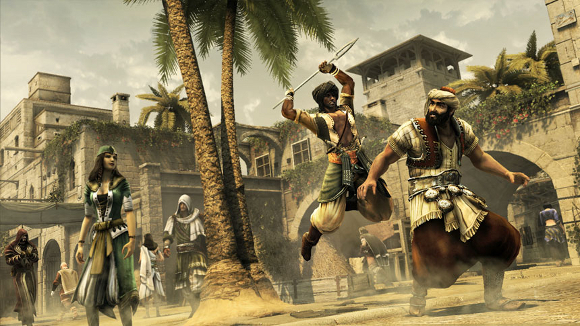 The overall visuals have transitioned from Brotherhood’s renaissance period to a Middle Eastern atmosphere. Before I get into the newly vamped gameplay of the beta, I first will talk of the customization. The customization in the beta is a new implement in the mutliplayer. I tip my hat off to Ubisoft for the amount of variety that can be done; from changing the outlook of your character-face, chest, legs, outfit, and equipping different taunts and stuns to the fold. The feature of abstergo credits is like virtual currency or money. Abstergo credits are earned through the various game modes in the beta. The credits can be used to buy particular abilities, emblems, and character appearances as you level up accumulating large session scores per match. But personally for me, the gameplay has drastically shifted in a way of a double-edged sword. The gameplay of Assassin’s Creed Revelations multiplayer has been restructured different from Brotherhood. The detection meter has been reversed for this version starting at discreet and basically allowing the meter to fill-up to incognito once your target is in your line of sight for the kill. When I first started playing the beta, I was frustrated with this mechanic because the game-style becomes much slower than it was to Brotherhood with fast-action kills and moving on with the next target. This was done to downgrade the amount of roofing in Brotherhood since players would accumulate 500 points and more with effortless kills they didn’t deserve from Brotherhood’s old detection meter. However, with my experience playing Brotherhood, I’d adapted and found success in the Wanted game mode and Deathmatch mode winning majority matches. In regards to the detection meter, if I were to kill my target with a discreet or reckless approach, the kill animation would be a long brutal execution. On the other hand to killing my target with a silent or incognito approach, it would be a quick stab kill and makes for an easy getaway. With a good offense, comes a definitive defense known as a stunning. This was a last resort to defending yourself from other pursuers who wanted you dead, with the mash of O or B – respectively the PS3 controller and Xbox 360 if you were waiting on a countdown for your abilities to reset back. In Brotherhood, stunning was occasionally used by either getting off your defensive abilities in time such as smoke bomb, mute or charge, or naked stun- knocking your pursuer to the down without any abilities, it took skill and instinct to get it off. In the beta, the Ubisoft developers have vastly enhanced the range of the stuns and speed timing. In my view, the stunning mechanic only had to be a faster move action compared to the slow wined-up punch to the face in Brotherhood, why would Ubisoft enhanced the range? The Assassin’s Creed Revelations beta took a step back from Brotherhood. I know the final product is two months away but the game-style feels more catered to the casual gamer. The beta had its high moments with the variety players winning matches with different ability load-outs of morph, disguise- my success of matches was with disguise and smoke bomb. Another was the respawn time loading much faster whenever death was eminent. In the end this phenomenal title will be more about the driven and pivotal story of single-player than the dumb-downed multiplayer. The official game will be released on November 15, 2011 for the PS3, Xbox 360 and PC.